The blood-brain barrier (BBB) regulation is characterized by an interplay between endothelial cells, subendothelial basal laminae and astrocytic cells. Astroglial cells are highly polarized by the differentiation of perivascular membrane domains. These domains are characterized by the aggregation of, among other molecules, the water channel protein aquaporin-4 (AQP4), the dystrophin-dystroglycan complex, and the inwardly rectifying potassium channel protein Kir4.1. Normally, this ion channel plays an important role in spatial buffering of extracellular K+ in the central nervous system, which only can be performed due to the non-uniform distribution of Kir4.1 across the surface of the glial cell. In this study, we observed a mislocalization of Kir4.1 in various human brain tumors (low- and high-grade astrocytomas and oligodendrogliomas), suggesting that buffering capacity of glial cells may be compromised, leading to water influx (cytotoxic edema). 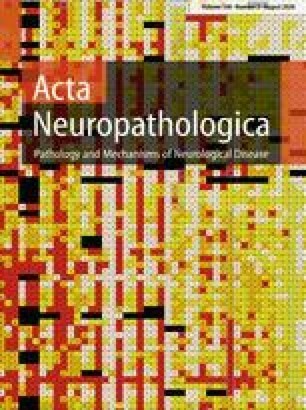 Interestingly, whereas dystrophin remained regularly restricted at the endfeet membranes in all cases investigated, AQP4 was found to be redistributed only in high-grade astrocytomas, not in low-grade astrocytomas. If the mechanisms of redistribution of AQP4 and Kir4.1 are different in low- and high-grade gliomas, this may suggest that the mechanisms of clustering of AQP4 and Kir4.1 at the glial endfeet membrane domains are also different. The redistribution of AQP4 in glioblastoma cells is discussed as a reaction to the vasogenic edema, as induced by the breakdown of the BBB, to facilitate reabsorption of excess fluid. We thank Dr. A. Reichenbach (Leipzig) for discussions and careful reading the manuscript.